SHE'S cute as a button and ready to be a star. 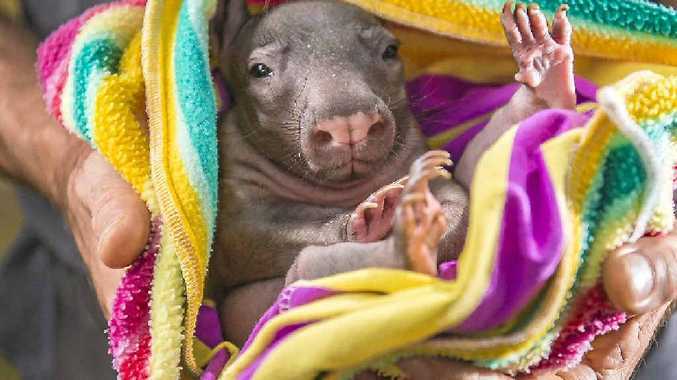 Ruby, the rescued baby Southern hairy-nosed wombat, will be a popular attraction at an environment expo in Gladstone next month. The orphaned wombat, along with her furry cousins Rain, Storm, and Ruben, will feature at Ecofest on June 1. The babies are being raised by volunteers from Australian Animal Care and Education (AACE) at Safe Haven. The Mount Larcom sanctuary cares for a range of orphaned native animals and runs breeding programs for both wombats and bridled nailtail wallabies. Gladstone Regional Council Environment portfolio spokesperson councillor Col Chapman said Ecofest was a good opportunity for the community to celebrate the region's environment and wildlife. "Safe Haven will bring along a variety of wildlife this year for viewing, including wombats, snakes and lizards," he said. Ecofest will be held at the botanic gardens, from 9am to 3pm. There will be environmentally-friendly market stalls, displays, wildlife demonstrations, guest speakers, live entertainment, food and drink stalls, plus free face painting, jumping castle, rock climbing wall, Ecofest tattoos and children's art and craft activities.